8 pp. Roman, 585 pp. Cruelty has many faces. It would be pointless to aim to list all forms of cruelty, from a child’s torment of animals to torture by secret police. Even the institutionalized forms are remarkably manifold – war, torture, prison camps, forced prostitution, human sacrifice, bloody initiation rituals, deadly and bloody combat sports, hate radio, splatter movies or public torture of animals are just some examples. The list of institutionalized cruelty remains ever-unfinished, as cruelty itself develops to remain state-of-the-art – from impalement, crucifixion, garrote and guillotine to the mass shootings, gas chambers, and human experimentation of Nazi Germany, and the weapons of the Holodomor and Gulags of Stalinism, to the homosexuals in Iran who are hanged on cranes, the hand grenades of the Interahamwe, and the orange suits of the prisoners at Guantánamo. Cruelty is a mirror of the living conditions and achievements of a society. It appears to be as old as humanity itself and crosses societal and cultural boundaries. No society can say that it does not allow cruelty to exist, even if societies differ to an extreme in the amount of space they give to cruelty and which forms are practiced in these particular spaces. Cruelty as an empirical phenomenon appears unable to avoid the cultural and historical relativity of good and evil, morality and immorality, and right and wrong. Researchers from throughout Europe and the United States met at the conference on Institutions of Cruelty – Interdisciplinary Perspectives in Rostock, Germany, in late June 2009, to reflect on and discuss the prospects for theory building and research on cruelty. The treatments published in this volume give insight into the subject matter of the conference by presenting interdisciplinary research findings – from anthropological, sociological, psychological and political philosophical foundations of cruelty over topics on torture and human sacrifice – from an historical as well as contemporary point of view – up to various perspectives on the history of cruelty in different parts of the world. While the individual articles have different emphases, the overall context is an ethnography of cruelty that cannot be deterred or restricted by the boundaries of societies, cultures, or historical epochs. Taken together, the articles claim to examine cruelty as a universal phenomenon, whereby also anthropological issues are given high priority in the coordinate framework of the research questions. 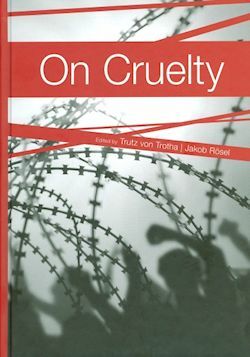 Jakob Rösel und Trutz von Trotha legen mit „On Cruelty“ ein herausragendes Werk vor, das den aktuellen und interdisziplinären Stand der Forschung reflektiert und in Teilen neue Erkenntnisse zum Thema präsentiert. Es sind zwar – das liegt in der Natur der Sache – Parallelen und Überschneidungen zur Kriegs- und Gewaltforschung zu konstatieren. Dennoch kann hier von einer simplen Übertragung (oder Wiederholung) der Erkenntnisse auf den Phänomenbereich der Grausamkeit nicht gesprochen werden. Vielmehr wird Grausamkeit einerseits als spezielle Gewaltform analysiert und deren Spezifika, Charakteristika und Funktionen herausgearbeitet und andererseits deren Konzeptualisierung und Theoretisierung – den Hauptzielen des Werkes entsprechend – erfolgreich vorangetrieben.